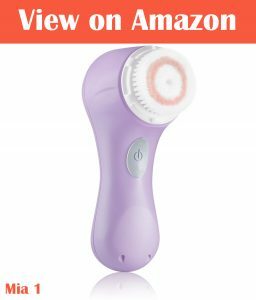 These products are designed and made by Clarisonic. They are mainly used to clean and massage the skin to keep it clean and incredibly smooth. Both of which these cleaning brushes are quite popular and well liked but which is the better option for you and your needs? Below I will give you the differences and similarities between the 2 so you can make the best decision depending and what you are looking for based on your budget. As you may have already guessed from the name the Mia 2 is the higher end version and higher in price though both of them are similar in their functionality. Let me explain why further below. The Mia 1 is compact in size, but this also helps when working some of the more difficult areas such as the bottom of the nose. In terms of the functionality it works like a charm and you will see and feel a difference almost immediately after using it. Especially after a couple of weeks the difference should be dramatically positive. With the Mia 1 there is only one speed available unlike the Mia 2 which has 2 speeds. For some people the Mia 1 speed is a little to quick and rough which isn’t great especially if you have sensitive skin. The Mia 1 is battery powered and on a single charge can last about 1 week based on daily usage. The device is built with a rechargeable battery, so you have no need for purchasing batteries which is what I would expect from such a product. 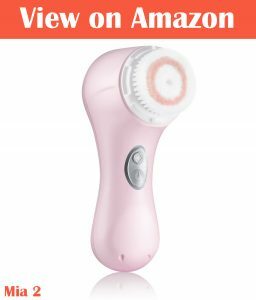 Just like the Mia 1 the Mia 2 does an amazing job at cleansing the skin and with the slower speed option it allows for use on much more sensitive skin. You also have the option to stick with the default speed which also works great in most situations. It works amazingly well at removing all dead skin and any black heads and just generally giving the skin a nice clean all while basically giving the face a massage. I particularly prefer the slower speed option because I find it more relaxing and smoothing and almost like a massage to the skin, its therapeutic in a sense for me. The Mia 2 just like the Mia 1 comes with a built in rechargeable battery that works just as you would hope for. Though the Mia 2 has a slightly better battery life. With the Mia 1 lasting about 18 minutes and the Mia 2 lasting about 25 minutes. 2 Both have the option to change brushes whenever you like and there are a host of different options depending on your skin type. 3 The Mia 2 has a feature which allows for a pulsing T-timer which runs for a minute whereas the Mia 1 does not. This is used just as a timer for each part of the face. I personally used it 1 minute for each side of the face so I don’t over brush my face by using it for too long. 4 Both are fully waterproof. 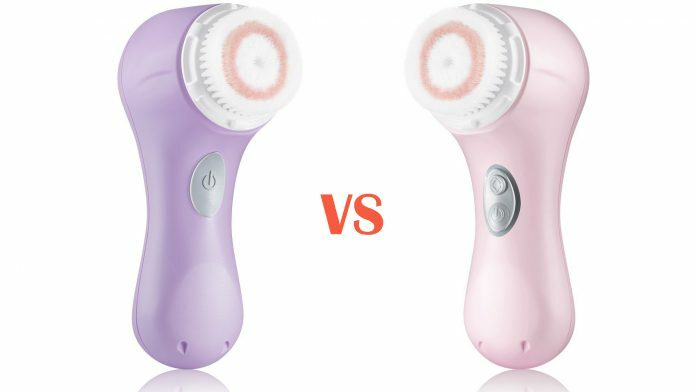 5 Both have the oscillation technology which is a back a forth movement designed to work with even the most sensitive skin. 6 Both have a rechargeable battery and a charger included. 7 Both come with a sensitive brush head and sample size cleanser. The Mia 2 also comes with a travel case. 8 The Mia 2 build quality feels more durable and sturdy than the Mia 1. 9 The Mia 2 is more expensive than the Mia 1. 10 Interestingly the Mia 1 has a 1-year warranty whereas the Mia 2 has a 2-year warranty. Both of these products do a great job of keeping your skin smooth and looking as flawless as ever. Though for me the Mia 2 definitely has a couple of elements that give it a definite edge. Having the slower speed option, I personally preferred a lot that simply isn’t available on the Mia 1. The Mia 2 also has the timer function which is useful for not overusing the brush on the face for to long, again which the Mia 1 doesn’t have. Also the Mia 2 feels a little more durable and sturdy in the hand. This may sound like I don’t like the Mia 1 but this couldn’t be more far from the truth. It does a great job just when I compare the 2 the Mia 2 is the better option though you are going to have to pay more for it. Overall if you are looking to save more money the Mia 1 is still an excellent choice though if you want the best option opt for the Mia 2.